While I saw the movie before listening to the audiobook, I must say that I still really enjoy the main character. He’s one of those guys you love to hate, but he’s trying so hard to do the right thing, even if it means defending a scumbag who deserves a lot worse. Of course, since I had seen the movie already, I had an idea how it was going to end, but couldn’t remember the specifics. Perhaps that’s a measure of a great crime drama: all the misdirection makes it difficult to know “whodunit”, allowing future rereads to be enjoyable. But, back to the main character, Mickey Haller, I think one of the reasons this book was a breeze to listen to was because the main character’s POV is so well written. You can tell that he has some baggage from his father, which is partly why he defends everyone, regardless if they’re guilty or not. The fact that Haller knows his way around the legal system and uses it to his advantage to even get the guilty an innocent ruling just shows that he takes pride in his work, even if it labels him as someone who keeps the crime on the streets. The plus to this audiobook was also the narrator, who was awesome in bringing all the different characters to life with his voice acting. Even if the story is told from the point of view of the eponymous “Lincoln Lawyer,” there are plenty of interesting people in this book, and each one certainly has a different “sound” to them. It’s the attention to these details that differentiates a narrator just reading a book to you and a voice actor who can bring the events happening in the words he’s speaking to life. 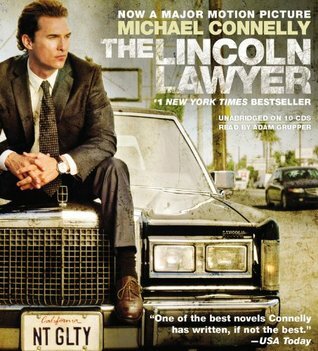 A great start to an interesting crime drama series, I give The Lincoln Lawyer 4.0 stars out of 5.